Garage Door Won't Close - Overhead Garage Door, Inc. Anticipating garage door repair is intimidating. The costs are high and there’s no telling when you can use your garage door again. Fortunately, some common garage door repair symptoms can mean minor issues. Do you notice your garage door won’t close? While this is a severe issue, it’s a common one. An ill-performing garage door could be the ticket to needing garage door repair. Or, you’ll only require a simple maintenance service. Regardless of what you need, never ignore these common signs. Here are 10 reasons why your garage door isn’t working. Always call a garage door service when you experience these symptoms. To open and close your garage door, there needs to be power. The power comes from your transmitter. Your transmitter runs on batteries. If its batteries have no juice, the transmitter can’t send signals to your garage system. To know this is the problem, it’s best to call a garage door repair professional to evaluate the transmitter. But if this is the issue, it’s a simple fix. A garage service can easily do this fix for you. When your garage door would close, did it ever open back up if something was in the way? Ever since 1993, garage doors were installed with a photo eye. Two tiny photo eyes exist at both sides of a garage door, detecting any movement or objects near the door. If your garage door isn’t closing, this is an indicator your photo eyes are the problem. Sometimes they need a simple cleaning. Other times they’re out of alignment or need adjusting, which is best handled by a professional. In order for your garage door to properly move, your track needs the correct alignment. The track is a metal piece that supports the garage door as it moves. Track alignment problems are one of the most common garage doors issues, but alignment can have different meanings. Gaps can form between the track and the door’s rollers. The track can even bend which requires repair. If you suspect alignment issues, call a garage door repair service immediately. If the issue persists, it will get worse. Do you notice the issue occurs when you use a garage door opener? Try closing the garage door with the opener first and then try closing the garage door with the button inside of the garage. If the garage door closes with the button but not the opener, then your opener, or your transmitter, isn’t working. Common transmitter issues include being too far away and your neighbors’ transmitters interfering. You may also need transmitter repair or a new garage door opener. It’s best to consult with an expert first. If something is blocking your garage door, this is an easy explanation. But oftentimes, you don’t know something is blocking your garage door. Earlier, photo eyes were mentioned. They detect objects that can block your garage door. But photo eyes don’t only detect objects directly under your garage door. They detect objects up to a certain area. Maybe your car isn’t parked in fully or an object is too close to the door. Try and move as many items as you can. If nothing works, then it could be a more serious issue. When your garage door stopped closing, was it a sudden issue? Or did you experience other symptoms? If your garage door suddenly stopped working, you may face broken springs. Broken springs also make a large banging noise. The garage door itself doesn’t open and close. The springs do the heavy lifting, ensuring your garage door opens and closes correctly. When the springs break, it’s a serious issue. If you suspect you’re facing broken springs, call a garage repair service. Do you notice your garage door begins to close but opens back up again? Your settings could be incorrect. The limit settings signify how far your garage door opens and closes. When the setting is too high, your garage door won’t fully close. This is a common issue in new garage doors, but old garage doors also face this issue when they need resetting. To ensure you get the correct settings, hire a garage professional to fix your limit settings. Is your garage door not closing, but the motor is still running? The issue is likely the disconnect switch. In case you lose power, your garage door has a disconnect switch. Rather than open and close your door automatically, you have to open and close your door manually. If this is the case, you’ll have to close your garage door manually. A garage door service can also disable the disconnect switch for you. Like every other door in your house, you have the ability to lock your garage door. This is most common in older garage doors. Older garage doors usually have manual locks for security purposes. If everything else comes clear on your checklist, your garage door is likely locked. Your tension springs and cables help your garage door safely reach the ground. If your springs or cables are broken, your door won’t close. If your door does close, it will crash on the ground. This issue is extremely dangerous. If you suspect the problem is in your springs or cables, call a garage door repair service immediately. It’s easy to freak out if you’re experiencing garage door issues. If your garage door won’t close, this signifies a minor issue or a major repair. These common issues help you troubleshoot the potential cause. But it’s always best to call in a garage repair service. 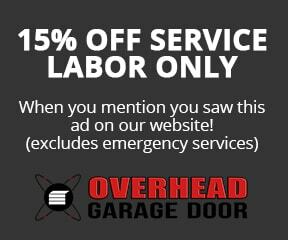 Are you having issues with your garage door in Chicago? Look at our garage door repair services.